A leader with a soft glove, Rabbi Herbert Morris, dies – J. Though bedridden and just days from death, Rabbi Herbert Morris was still on the job. “I’m not doing any more weddings,” quipped the retired spiritual leader of San Francisco’s Congregation Beth Israel-Judea when his wife mentioned that someone needed his help. It wasn’t a wedding at all, but an 11-year-old girl who had recently been diagnosed with cancer. Displaying the human touch that characterized his almost half-century career, Morris gave the girl a baseball cap inscribed with a healing prayer that had been given to him in his own battle with prostate cancer. He then told the young visitor that “when she’s finished with that hat, she should give it to someone who needs it more,” recalled Morris’ wife, Judy. “That was an incredible moment,” said Judy Morris. There were many such moments for Herbert Morris, who died Nov. 7 at his Walnut Creek home. He was 73. “He led with a soft glove,” said his wife of 50 years. Morris was among the first rabbis to step off the bimah during sermons. “He had a way of personalizing things in his talks that touched people,” said Rabbi Evan Goodman, who first saw Morris in action as a boy and assumed Morris’ job when the rabbi retired in 1998. Morris was also an early trailblazer in his willingness to perform interfaith marriages. But one of his biggest pairings involved presiding over the potentially tricky merger in 1969 of Reform Temple Judea, where he had served since 1962, and Conservative Congregation Beth Israel at Judea’s new home on Brotherhood Way. “You’re talking about a deep ideological divide at that point between the movements. He and lay leadership really made it work,” said Goodman. One way he did that was by writing a special High Holy Days prayerbook combining liturgy of the Reform and Conservative movements. He also gave a Reform orientation to Friday evening services and a Conservative feel to Saturday mornings. Sanford Heisler, who served as Temple Judea’s president in 1967, said Morris was both an innovator and a great communicator. He introduced an adult b’nai mitzvah program along with confirmation class trips to Israel. Heisler said Morris was a firm supporter of women’s causes, civil rights and Israel. Traveling was a passion for Morris, and he signed on several times as a Jewish chaplain aboard cruise ships. His first position as a new rabbi in 1956 was a two-year stint in Japan as a Navy chaplain. Later in his career, he served as a chaplain for the San Francisco Police Department. An estimated 650 people attended his funeral service Sunday, Nov. 9 at the synagogue. A native of Trenton, N.J., Morris played tennis every Tuesday in Mill Valley with Laurie Williams, a friend who happened to be the mother of comedian Robin Williams. He was also fond of musicals and singing in general. In addition to his wife and grandchildren, he is survived by his son, Bram Morris of Oakland and daughters, Rayna Arnold of San Ramon, Tammy Dollin of Denver and Dena Kaufman of Scottsdale, Ariz. 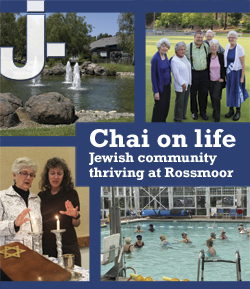 Donations can be made to the Rabbi Herbert Morris Fireside Room Fund, care of Congregation Beth Israel-Judea, 625 Brotherhood Way, S.F., CA. 94132.